The views in the Conejos River Valley are gorgeous, and the fishing is pretty great, too. This 93-mile tributary of the Rio Grande boasts some of the best fly-fishing in Colorado—minus the crowds. Fly-fishing requires some skill, both in terms of technique and knowledge of local fish and their habits. If you’re not quite ready to strike out on your own, hire a local guide to help you find the best spots to fish. Best location to fish varies by season; some restrictions in winter. 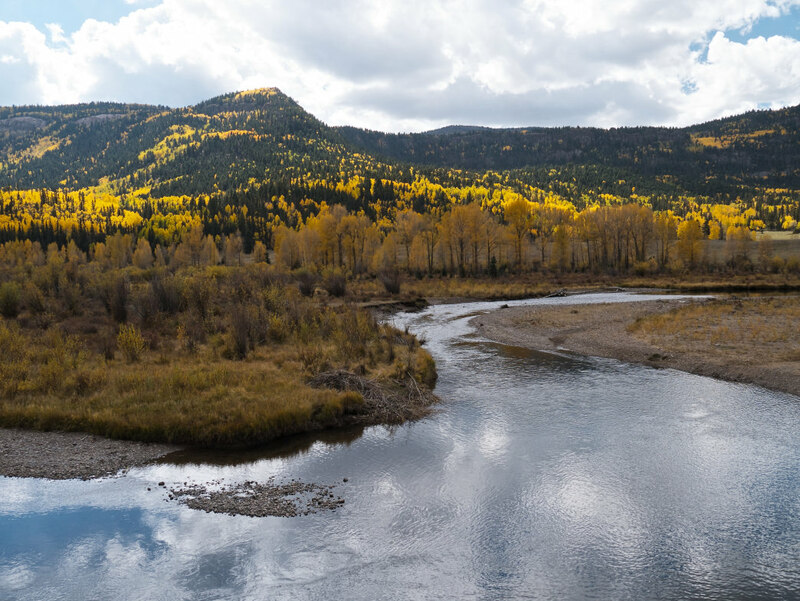 The 93-mile-long Conejos River, a tributary of the Rio Grande, drains the eastern San Juan Mountains, which features some of the San Luis Valley’s most incredible scenery. Flowing from snowmelt beginning just northeast of Pagosa Springs, the Conejos meets up with the Rio Grande about 15 miles southeast of Alamosa; just south of there, it’s dammed at the Platoro Reservoir, which controls flooding and irrigation for San Luis Valley agriculture. Much of Conejos County was ceded to the United States in land grants from the Mexican government in the mid-19th century, and settlements along the river popped up here, thanks in part to plentiful fishing. Mostly wide and shallow, the river only occasionally has steep descents, and near Antonito, Colorado, it’s home to some truly spectacular fly-fishing. The beautiful, remote Conejos River Valley, just west of tiny Antonito, Colorado, is home to rugged cliffs, including The Pinnacles (a popular whitewater rafting destination), and wide-open meadows perfect for casting. It’s basically home to every type of trout imaginable, and it’s not hard to see why fly-fishermen come from all over the American West to check out the Conejos. Several local outfitters can be hired for guided trips, and a few retailers specialize in seasonally appropriate flies. Best access points for fishing the Conejos include the headwaters, above the Platoro Reservoir, the Lake Fork of the Conejos, Saddle Creek to South Fork, and South Fork to Menkhaven Ranch (some access points for this last spot are on USFS property, but be sure to respect private property when you see it marked). There’s fishing to be had on the Conejos year-round, though summertime is by far the best season. Whether you’re an expert angler or a newbie, though, the Conejos is a terrific place to take in the picture-perfect sights and enjoy the excellent casting. Fishing below the dam is nice on warm winter days. Spring fishing is good in the tailwater section, but avoid the heavy spring runoff in June; midges and mayflies are best for winter and spring conditions. Fish those plus stoneflies, caddis, and terrestrials in the summer, and in the fall, when you’re most likely to catch a big brown, fish midges, mayflies, and caddis. There’s tons of public land access to the Conejos; downstream from Platoro Reservoir is definitely the most popular stretch. If you’re really aiming for solitude, you can hike a little longer approach above the Platoro, where the fish tend to be a bit smaller (but the crowds are smaller, too). Most public access is on USFS land, but be sure to obey parking restrictions at your chosen access point (no overnight parking, etc.) and avoid private property.